Khashoggi, who has lived in self-imposed exile in the U.S. for the last year, vanished Tuesday while on a visit to the consulate. A Turkish official, requesting anonymity to discuss the ongoing investigation, told the AP earlier Saturday night something similar. “Jamal is not dead! I don’t believe he’s been killed!” his fiancée Hatice wrote on Twitter late Saturday night. Turkey’s official Anadolu News Agency said Saturday that the Istanbul public prosecutor’s office began a probe into Khashoggi’s disappearance Tuesday, immediately after he went missing. It added the investigation over allegations that the writer was detained had “deepened,” without elaborating. The state-run Saudi Press Agency early Sunday morning carried a statement from the Istanbul Consulate that “strongly denounced these baseless allegations, and expressed his doubt that they came from Turkish officials that are informed of the investigation or are authorized to comment on the issue.” It said Saudi Arabia sent a team of investigators to help look into the case. The dispute over Khashoggi’s disappearance also threatens to reopen rifts between Ankara and Riyadh. Turkey has supported Qatar amid a yearlong boycott by Bahrain, Egypt, Saudi Arabia and the United Arab Emirates over a political dispute. Turkey’s support of political Islamists, like the Muslim Brotherhood, also angers leaders in Riyadh and Abu Dhabi, which label the organization a “terrorist group” threatening their hereditarily ruled nations. U.S. Sen. Chris Murphy, the Connecticut Democrat who sits on the Senate’s Committee on Foreign Affairs, expressed shock over the news. 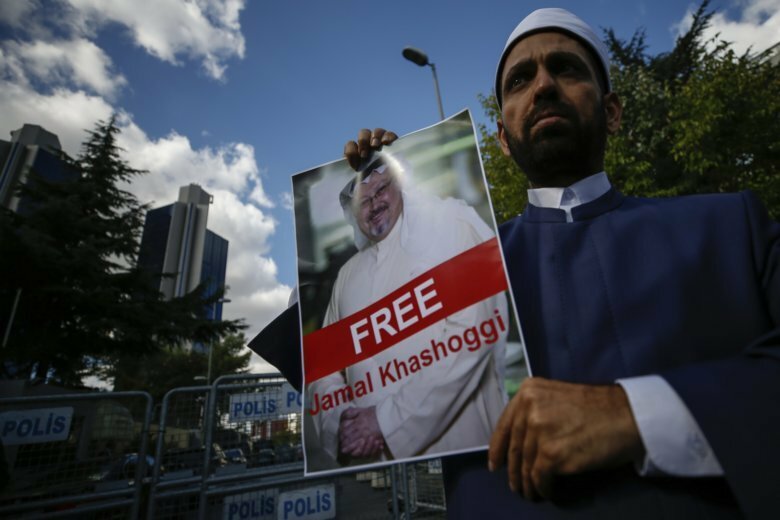 Press freedom groups likewise have decried Khashoggi’s disappearance. “If Khashoggi was indeed murdered inside a diplomatic facility, it is an act of terror that echoes Russian and Chinese tactics of extraterritorial, extrajudicial attacks on dissidents, intended to intimidate any who would speak out against the Saudi government, no matter where they may be, and giving the lie to official narratives of ‘reform’ in Saudi Arabia,” said Summer Lopez, PEN America’s senior director of free expression programs. “If Saudi authorities wish to counter these claims, they must produce Khashoggi immediately. If the killing is confirmed, those responsible for this heinous crime must be held accountable,” she added.